I feel like that really annoying person on facebook because I posted a bunch of pictures of my vacation and then of our engagement. People are probably making gifs for #myfriendsaremarried right now about me. Oops. This vacation was a little last minute for us. We started talking about going back to Park City, Utah, for a ski vacation in December but there were a lot of unknowns with my work schedule (big project deadlines) and Matt's possible move. At the beginning of February and still without a trip planned, we decided to start looking again. We absolutely loved Park City last year, but I figured out that we could visit Jackson Hole for about the same price. Jackson Hole has had a crap-ton of snow this year (that's the official term) and I've always wanted to visit there. Plus my uncle lives there so we would get a chance to see him as well. Soon our plane tickets and hotel was booked and I was counting down the days until we could leave. Our flight was Saturday afternoon so I spent the morning cleaning and packing and then taking a few boxes down to the new apartment. Going on a vacation right before you are supposed to move is probably not an advisable decision but I did it anyways. I wasn't around to stress out about all the things that needed to be packed and cleaned so that was a benefit. Getting to the airport was no problem but carrying skis, boots, a roller carry-on, and my purse makes me look hilarious. I ran into several things with me skis because I kept forgetting how wide they were. 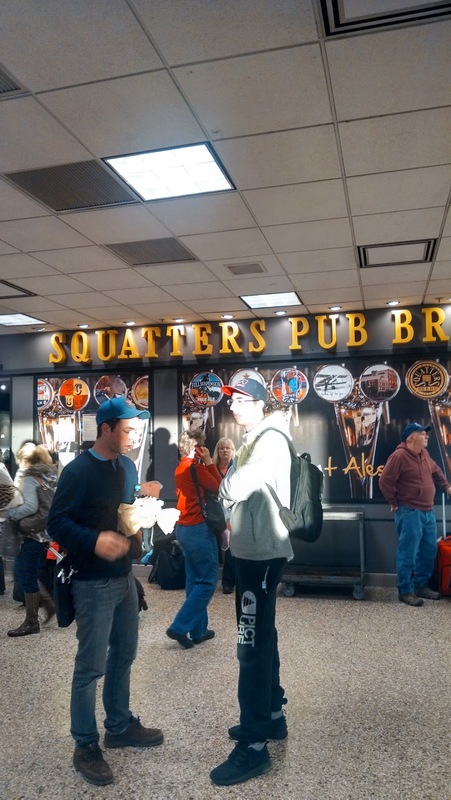 We had one layover in Minneapolis and then we were off to Jackson Hole. We ate hard-boiled eggs and apples during our layover and I felt like such a healthy living blogger, but I just didn't want the eggs to go to waste so I brought them along. The second flight went smoothly for the most part but once we got over Jackson Hole I could tell something was not going well when we started circling. Jackson Hole was getting snow and visibly was crap. We circled for quite a while and there was lots of turbulence which did not sit well with my stomach. Thankfully I made it through the turbulence and instead of landing we took off towards Salt Lake City to wait out the storm. 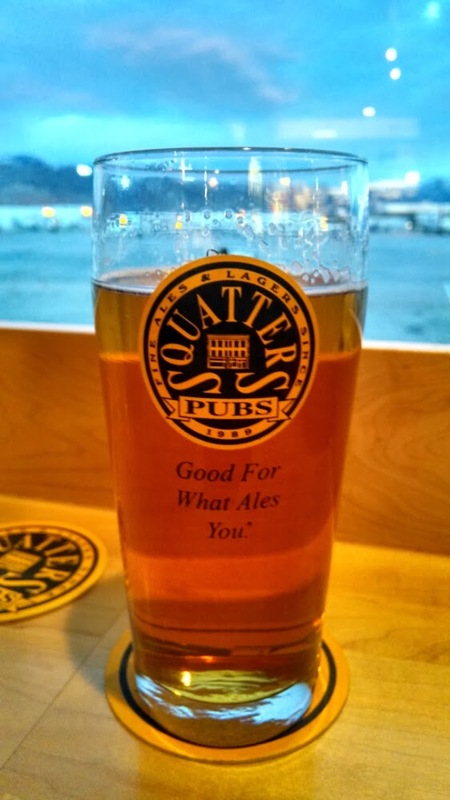 Matt was all worried that the plane was going to reboard soon and leave without us but I convinced him to at least have a beer at Squatter's. We ended up getting dinner too. We could have taken our sweet, leisurely time because we didn't end up getting back on the plane till 3 hours later for trip #2 to Jackson Hole. The air time is only about 30 minutes so the flight wasn't bad at all. But once again, we circled, and circled. And then we headed back to Salt Lake City. Jackson Hole Mountain ended up getting 19 inches of snow that day which made for some epic skiing on Sunday (and terribly long lift lines) and we missed it. We were put up in a hotel that night with a flight scheduled for the next day at 7 am. By the time we got to the hotel it was nearly 11 pm and we were back up at 5 am to catch our flight. About 15 minutes after we got through security and got to our gate, we got a notice that our flight was delayed till 9 am. So they brought us donuts. This is by far the worst flight experience I've had and I know this is peanuts compared to what some people have had to endure, but I kind of just found this whole thing to be hilarious. The weather did just not want to cooperate. At one point, Matt mentioned that we could have driven from Chicago and been in Jackson Hole already. I thought it was ironic that we could see the mountains from the airport and yet we couldn't ski them. At 9 am, we boarded the plane and waited for our pilot to arrive from Denver to fly us to Jackson Hole. The airport there has short runways so pilots need special certifications to land there. When he walked onto the plane a bunch of passengers cheered which was funny because we were still in SLC! Thankfully the flight was uneventful and we landed in Jackson Hole! I yelled "TOUCHDOWN" when we landed and everyone on the plane cheered. By the time we got all settled into our hotel, it was already noon, so we skipped downhill skiing for the day and instead found a place where we could rent cross-country skis. It was super windy and I had one sticky ski but we had a lot of fun. We even saw a moose! Which really freaked me out. 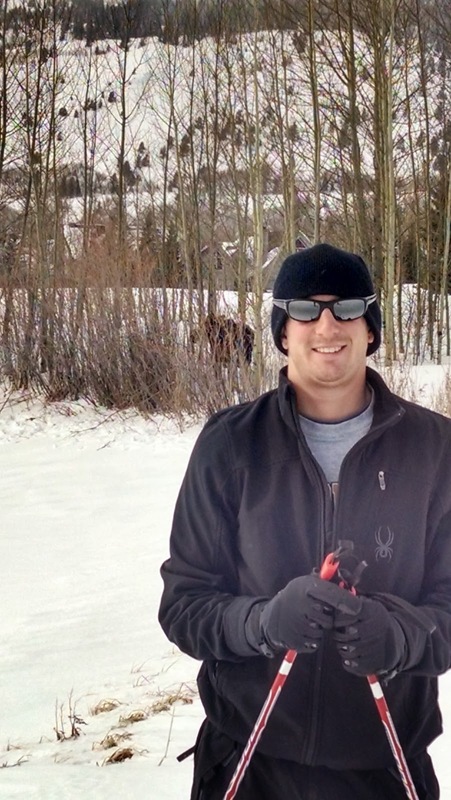 I took off my skis just in case the moose decided to attack even though I'm sure that still wouldn't have done any good. We skied for a few hours then headed back to relax at the hotel. Traveling is exhausting and I needed a nap! For dinner we hit the Snake River Brewpub. This place was so fun! They have a brew kettle right in the restaurant that they were using when we walked in. 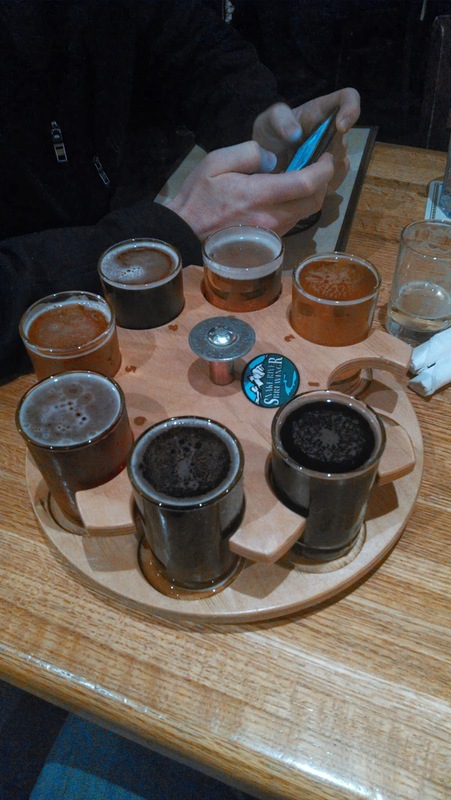 Of course we had to try the sampler round. 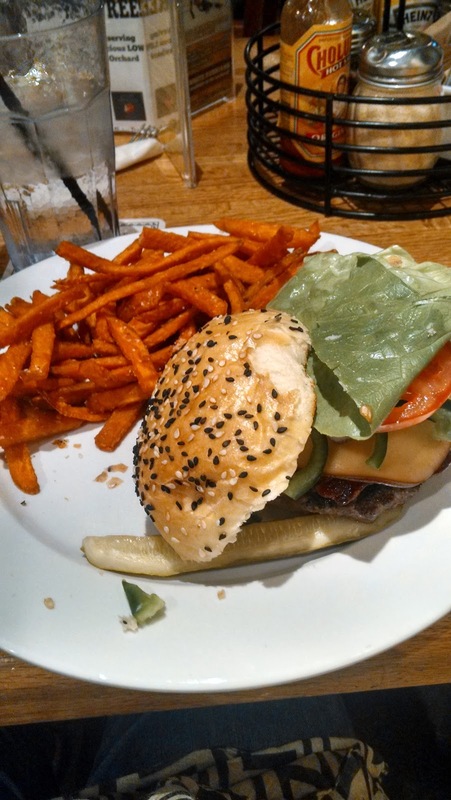 I ordered by first ever Bison burger and really enjoyed it. We left stuffed and a bit tipsy. Part Deux to come!